People in at-risk areas fearing the loss of homes due to avalanches are now facing the certain loss of them when the snow is no longer a threat as the city plans to begin demolishing the first of 142 residences targeted in late May or early June, with a total of 66 scheduled to be torn down this year. A map shows residential and guest housing that will be demolished under a plan approved Monday by the Longyearbyen Community Council. Buildings shaded in red are in the highest-risk area, which has been subject to long-term evacuations the past two winters as well as the current one. Buildings shaded in green are in areas deemed to also be at unacceptable risk without protective measures. Map by The Norwegian Water Resources and Energy Directorate. Four residences at Vei 226 – those at addresses 23, 25, 27 and 29 – will be the first demolished as part of a plan to build snow barriers on the hillside to protect homes further down. At total of 22 residences on the street are scheduled for demolition this year, along with 44 on Vei 220 and 224. The 66 units comprise a total of 7,200 square meters. 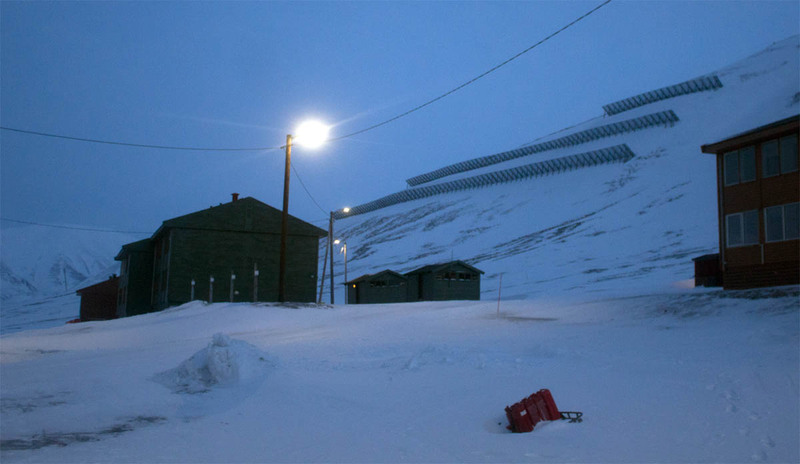 “This is one of the largest security projects I have been with in a local community,” City Manager Hege Walør Fagertun Fagertun, who has previously supervised demolition efforts at Bardu and Salangen, told Svalbardposten. The first residences on Vei 226 to be demolished belong to the city, Statsbygg and Store Norske. 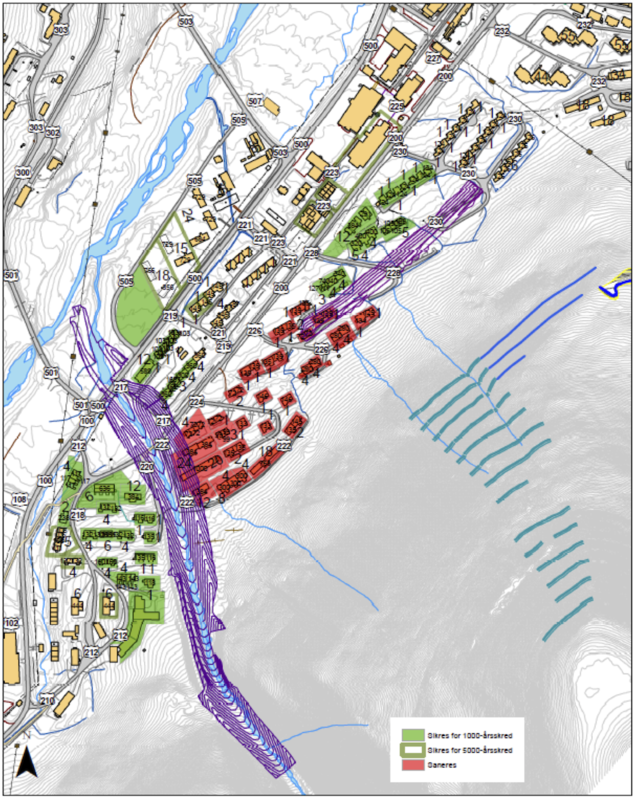 A report released last March by the Norwegian Water Resources and Energy Directorate showed a much larger area near the center of town was exposed to an unacceptable risk of avalanche than previously thought. Two large avalanches in 2015 and 2017 that destroyed homes and killed two people prompted the assessment, which declared climate change is causing increasingly severe and unpredictable storms that can trigger avalanches and landslides. As a result, areas considered to be at-risk have been evacuated numerous times before and after major storms since the 2015 avalanche. In addition to the 142 residences in the neighborhood known as Lia, about 100 dorms in Nybyen used by students at The University Centre in Svalbard are scheduled to be demolished. The full three-year plan to demolish 142 residences, build new ones in flat and seaside areas, and install protective measures and supporting infrastructure is projected to cost about 553 million kroner. Construction on barriers on the mountainside above homes and other buildings in the center of town began last spring. New housing is being built at an accelerated rate using hundreds of millions of kroner approved by Parliament for that purpose and protective measures in last year’s and this year’s budgets. But some employers have stated the new units aren’t enough to resolve a housing crisis where there isn’t enough space for employees during busy seasons. Also, while Olsen said the government will be paying most of the cost of the evacuations and reconstruction, some owners are facing the partial or complete loss of their properties.